GREG RUCKA has restored my faith in comics. He writes the two storylines for the Wonder Woman Rebirth books: the current timeline (with art by Liam Sharp and colors by Laura Martin) and the Year One story (with Nicola Scott doing the art, and with Romulo Fajardo, Jr. doing the colors). I thoroughly enjoyed the Wonder Woman Rebirth #1 issue, with its look at a transitioning Diana reconciling the differences in her own mind about who she is. But, I wanted to spend a moment to talk about the second issue in this series, one that evoked a strong emotional response from me today. These words connect back to the first issue, where Diana is in search of the truth of who she is. She senses that lies have been told, and she yearns to find the answers. The idea of truth and lies connects well into Diana's story because, as the bearer of the golden lasso, she has the power to bring truth into the light. That Steve (Trevor) is connected to truth on this first page links the two characters together. also tie into the larger story, as the idea of Diana's place in this "rebirth" is unclear, and she is lost as well. By the bottom of the first page, Steve has told his friend that he knows which way to go because of the stars, something that connects to the second page when we see Diana sitting with her sisters and Areto, an Amazon astronomer, who seeks to teach them. Diana looks out at the horizon, rather than the stars, and this bothers Areto, but this begins the foundation for Diana's sojourn into Man's World which we will undoubtedly see in upcoming issues. For me, this ties into George Perez's first issue of Wonder Woman (post-Crisis on Infinite Earths), when a young Diana sits beneath Athena's statue, yearning for purpose. She wants more from Paradise, and indeed, this Diana in Rucka's tale does as well. The horizon holds possibilities while the sky holds both stability and also unreachable ideas. I must add here, before I go on, that when I first read Wonder Woman #1 in 1987, I literally cried tears of joy. After having seen Wonder Woman devolved by the Anti-Monitor, and not knowing her fate, I was devastated as Wonder Woman has meant much to me growing up. Her new beginning then helped me dig deeper into my own writing. Rucka's story now evoked tears as well. It wasn't just that my eyes welled—I cried joyful tears. I felt like waiting for MY Diana to return ended with something I could never have dreamed for, but one that I will cherish. 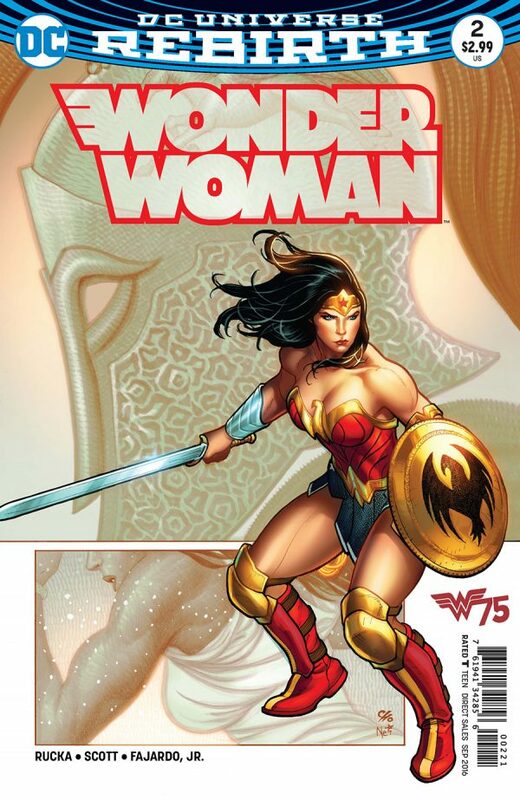 Rucka brings up the idea that the Amazons are, as Perez said, reincarnations of women whose lives had been struck down by men. This past for Kasia, Diana's friend, demonstrates that the past, while important, does not define who someone is. I believe Diana's past will do the same thing: provide her with support, but not define the scope of who she is. Her actions will do that. 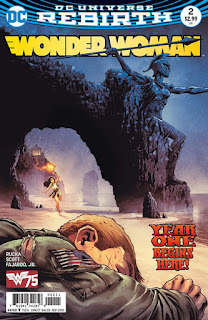 This is not a new tale of an Amazon looking for more beyond her own island home, but Rucka brings it new life. Diana returns to the palace and engages in an intriguing conversation with her mother. The queen addresses her as, "Princess." Diana replies, "Queen." Hippolyta says, "Daughter." And, Diana comes back with, "Mother." In these four words, Rucka has established a two-fold relationship between these two women, one that will undeniably resonate throughout this story. This page, as the ones before it, shows Nicola Scott at some of her finest work. This mother/daughter moment radiates warmth and love. The fact that Hippolyta wants Diana to engage with her and Phillipus in shooting arrows speaks to the hunting aspect of their culture, rather than through swordplay, a more warlike endeavor. That detail alone makes me think that Rucka doesn't want to focus solely on the idea of the Amazons as warriors. The next page brings yet another parallel to Steve's story as he is on a firing range with Nick. Finding a target seems to be a common element, one that will bring these two characters closer. The scene returns to Diana, Phillipus, and Hippolyta on the archery range, and Diana misses her target. When Diana offers her mother the opportunity to shoot, Hippolyta replies that she's happy to have Phillipus criticize someone else's archery skills for a change. At that, Diana shoots two arrows simultaneously into two separate hoop targets. Clearly, this Amazon princess should not be underestimated. At the slightest hint of a challenge, she rises to it, and surpasses it. The next two pages show alternating panels of Diana's life with Steve's, and Rucka establishes Nick as a brother to Steve while he shows Diana with her sisters. 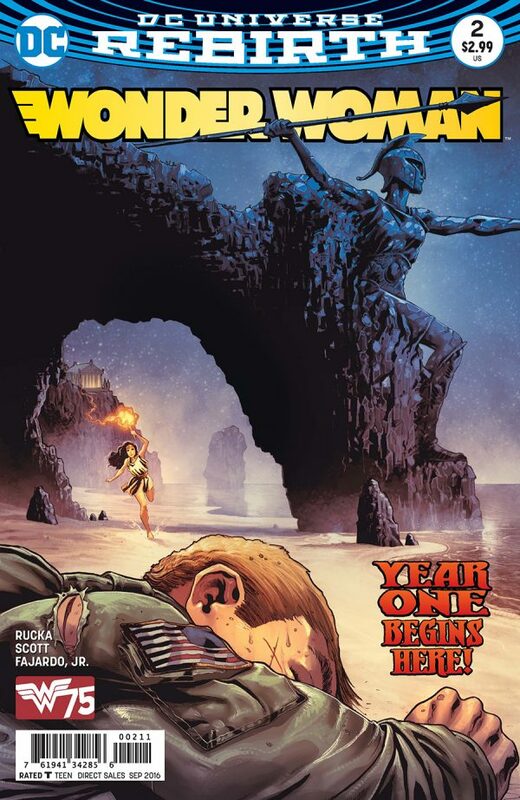 It seems clear, too, that time passes differently on Themyscira than in the mortal world, as we see Nick meet a woman and then marry her all within a few panels. Diana's life, by contrast, seems to be one of sisterhood, prayer, and even a discussion as to Diana's possible romantic relationships among the Amazons. Time is less of an obvious factor, which reinforces their immortality. The last panel shows Diana staring off at night while her sisters socialize. Truly, this one Amazon has her eyes on a different target. Next, we see Diana riding Kachi, her horse. I would certainly love to see her ride a kanga, but perhaps the menagerie of animals will show up later. Diana sees a gnarled tree that she doesn't recognize (a symbol of life perverted? a portal in the trunk to some other place? ), and when she reaches toward it, a snake strikes her wrist. It's worth noting that Diana is not wearing any bracelets, and has not been, so she has no protection from what this snake's possible venom might be. I am not clear as to why Diana's wrists are bare; even in Perez's version, the Amazons wore bracelets as a reminder of their imprisonment by men. But, time will tell. This page is particularly striking because, other than Diana, it lacks the vibrance of the life of Themyscira—certainly, a deliberate (and successful) artistic choice. Diana is found by her sisters, notably Io. The following page shows Nick and his wife, who has just given birth, and Steve enters. His kinship with Nick is broadened by being named Nick's child's godfather. Steve's brotherhood with Nick becomes augmented by this. "...This reaffirms my faith. The gift of the patrons to us, we daughters of Harmonia and Ares. Their promise to the Amazons." It would seem the promise of truth. Castalia tells Diana that when the gods give, the Amazons must be willing to give of themselves as well, and that time is coming. Truth and lies are interwoven between the two storylines (modern day and Year One), which makes sense since the layers of truth or deception build over time, sometimes becoming harder and harder to discern from one another. That is an interesting word to use. Discovery will be yet another motif of this story, for all involved, and while Areto's words are dipped in concern, discovery can bring about truth. The Amazons discover many dead among the wreckage, but then Steve's bloodied hand reaches out to Diana's foot, and his last words to her are, "Please help us." What I found intriguing is that, despite his life-threatening situation, he asks the Amazons to help "us" not "me." That tells me much about Steve: he cares about his fellow soldiers more than he simply cares about himself. I must take this time to speak of the art. Nicola Scott's renderings of emotion throughout this book are extraordinary. A range of feelings comes through on every page, and the younger princess goes through her share. Romulo Fajardo, Jr. complements Nicola's pencils with precision and highlights each nuanced feeling with much detail. Tone, color, and shadow create the beginning of an epic tale, one that I cannot wait to see unfold. All of the characters have life and, if you listen carefully, you can hear their hearts beating. As of yet, we have not learned about Diana's origin, so whether or not the Nu52 story of Zeus being her father is still relevant is unknown. But, this beginning of the classic tale breathes a different kind of breath into Diana's story, one of hope, compassion, love, strength, and wisdom. It bears mentioning, too, that Hippolyta is dark-haired in Year One, so the blonde Hippolyta we see in the Nu52 must be a twisting of the truth, perhaps a part of Dr. Manhattan's machinations we learn about in the Rebirth #1. While the fair-haired Amazon queen was a lovely nod to the Silver Age of Wonder Woman's history, Hippolyta has had darker hair since the 80s (and even earlier), and it is that image which most fans would recognize. I, for one, cannot wait for the truth to rise to the surface so we can see just who our Amazon princess is. With Rucka at the helm, I have no doubt we will be in for a glorious ride.